The National Wind Watch website has noted an article from North American Windpower magazine. Written by Andrew Chant and Ka-Ming Lin of ORTECH Power - it's an interesting article with some valid points. Personally I wince at statements such as, regarding the spot price (HOEP), "In 2008, they averaged about C$30/MWh, and in 2011, they were closer to C$20/MWh." But there are some interesting ideas appearing in this North American Windpower magazine article. Electricity in Ontario is a sensitive political issue, not only because the transmission system is provincially owned, but also because 60% of the generation supply is controlled by the province. The rapid rise in power prices caused by the projected increase in the global adjustment could have an adverse effect on the wind industry. With the Dalton McGuinty government in power in Ontario and the major opposition party calling for a moratorium on wind, the situation may be precarious for the FIT program and, by extension, the wind energy sector. ... There are about 60,000 micro FIT applications in the system. These will have a minimal effect on the global adjustment, but at an estimated two voters per household, this translates into 120,000 or more votes in favor of retaining the FIT program. Community projects should also increase the popularity of wind energy. 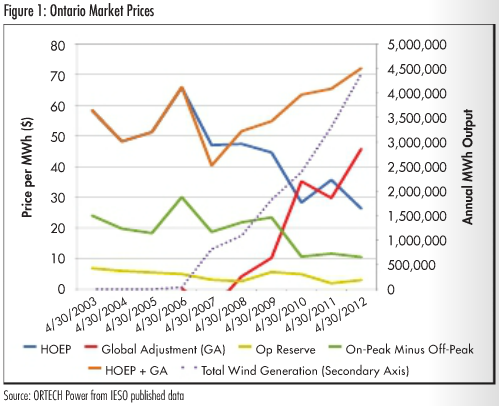 In addition, the IESO is responding to the oversupply of generating capacity by planning to make wind dispatch able. Under the current rules, this means that wind generators will be paid to not produce – a reality that may be politically unpalatable during time of economic uncertainty and rising power prices. However, there are many proactive measures companies can take to promote wind energy development. First, the industry should stress the number of jobs that are created by constructing the projects that are already on the books, as well as larger projects under development. Second, they should focus on the Darlington nuclear plant refurbishment, which is scheduled for 2017; this is when the majority of the wind farms will be operating and the surplus power problem will be abated. Third, developers should site wind facilities in areas where there is strong community acceptance. Areas home to cottages and hobby farms should be avoided, as these part-time residents usually have the means to fund challenges, and in fragile political times – or even in the best of times no politician wants to support a controversial project. I first posted the reference to this article, along with the comments, at the Wind Concerns Ontario Blog.